While you are honouring Earth Hour and celebrating Earth Day this spring, make plans to do a simple energy use audit of your home to see what you can do to make some changes. The time is now to make a difference and make sure the future will be a good one. Do what you can to reduce energy use. Disclsoure: I received compensation for bringing you information about the Ontario saveONenergy program. This post includes affiliate ads. If you buy something through these links, you will not pay more but I will receive a small amount of money to help pay for blog fees. An energy use audit is when you take a look around your home to see how your family is using energy and make a note of what changes you could make to reduce that energy use. You can use your power company bill to see if your changes are having an effect. Compare the energy usage listed on your bill before you start making changes and 4-6 months after to see if it’s had any effect. How did your audit go? Did you identify some changes you could make to reduce energy use? Reducing your energy consumption is good for both your wallet and the environment. Ontario wants to encourage it’s residents to save energy so every Spring the saveONenergy Spring Coupon Event helps Ontario residents every year to make the change to energy savings. The saveONenergy Spring Coupon Event happens every Spring (usually April) and offers coupons for energy-saving products at participating retailers throughout the province such as ENERGY STAR light fixtures, LED lights, light timers, dimmers and motion sensors, power bars with timer or auto-shut off, outdoor clothesline kits and more. 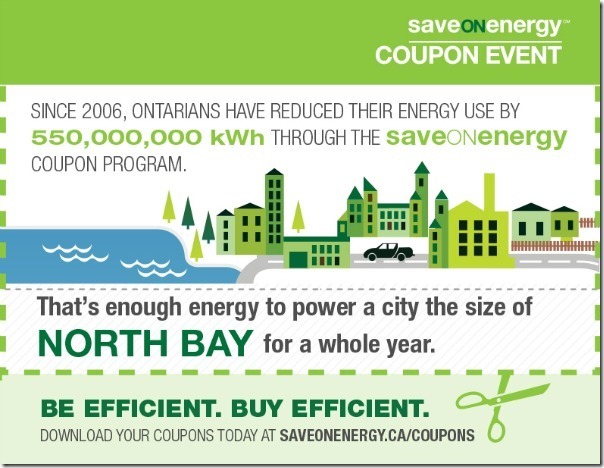 The purpose of the coupon program is to help Ontarians to reduce their energy consumption. Hundreds of thousands of Ontario residents have participated in a saveONenergy program in one way or another. If you’ve been considering outfitting your home with LED lights or a ceiling fan or clothesline, now is the time so you can take advantage of the savings!